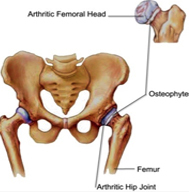 What is Hip Osteoarthritis and how does it occur? Hip osteoarthritis (also called Degenerative arthritis of the Hip) is one of the most common types of osteoarthritis. Osteoarthritis occurs as the cartilage of a joint, a soft tissue that provides cushioning and a smooth surface for joint movement, begins to degrade due to wear and tear caused by mechanical stress. As the cartilage breaks down and is worn away, the joint begins to function abnormally and small bony deposits can form around the joint. As this process progresses, movement of the joint begins to be painful and can eventually lead to significant disability. As we age, our cartilage often loses quality and elasticity – resulting in an increased likelihood of degeneration as we age, however osteoarthritis is not limited to the elderly and many young people are affected, although much less frequently. While there is no single identified cause for osteoarthritis, there are known risk factors that make a person more likely to develop the condition. These risk factors are increasing age, a family history of osteoarthritis, previous injury to the hip joint, obesity, improper formation of the hip joint at birth (a condition known as developmental dysplasia of the hip), genetic defects in the cartilage and, activities that put extra stress on the hips. The most common symptom is pain, followed closely by joint stiffness. The location of arthritic pain is usually around the hip joint but it can also appear in the groin, buttocks, thigh or knee. Other symptoms include a grating or cracking sensation with joint movement, tenderness around the joint, and swelling. Pain is most noticeable with weight-bearing activities such as walking, running or negotiating stairs. After a period of prolonged rest, the arthritic joint will often feel quite stiff. This can be particularly noticeable in the morning with many people reporting feeling stiff for 15-20 minutes after waking. In osteoarthritis, complete elimination of pain is not always a possibility. Physiotherapy is not able to change the structure of an arthritic joint, however it can assist in improving the function and strength of the surrounding muscles, which often contributes to pain. Physiotherapy management for osteoarthritis of the hip will usually include stretching, exercises and joint mobilization to increase the joint’s mobility, as well as resistive exercise to the muscles surrounding the hip, allowing them to better support the joint. Many other factors can help with arthritic symptoms such as appropriate rest, weight loss, physical activity and environment modification, mobility aids and NSAIDS. For many people the course of action is a surgical joint replacement, which can have great outcomes when coupled with effective preparation and rehabilitation. The information in this newsletter is for general use only. Please seek advice from a suitably qualified medical professional for guidance of your individual concern or condition.